This real life tale follows a girl who faced heavy bullying from fifth grade on through high school despite being transferred to two new schools in the process. Her parents hated seeing her as an outcast and tried everything they could think of to help her fit in including buying her designer clothes and taking her to a psychiatrist. Unfortunately, the solution offerred by the psychiatrist was to put her on medication and have her try harder to fit in socially. At the crux of all her problems in every school was her insistance on defending those around her who needed it. Those people ranged from nerds to physically handicapped students. Every community is different and faces difference kinds of bullying, but it is hard as an adult to look at students picking on those who have disabilities. There are instances where Jodee finds people who are willing to be friends with her, but almost always those people are presssured by the mass to back away again. If things weren’t bad enough, Jodee also has a physical condition that she is unable to remedy until she turns seventeen. Of course, once this condition is discovered the students make fun of her even more. In the end, Jodee attends her high school reunion, which seems unusual considering she hated these people so much she wrote a book about the experience. She comes to find that several of those people do not remember what they said or did or pretend like they don’t. Since Jodee is now very successful they all want to congratulate her and be her friend. Forgiveness is a powerful virtue, but it seemed almost too easy for Jodee to forgive these people after the physical and emotional abuse she experienced that sent her into a depression in high school. The fact she is able to share this story will be a comfort to those enduring the same thing and possibly a wake up call for those instigating it. 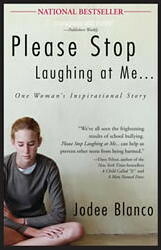 It’s a powerful story that all teenagers should read and discuss. This is a great book. I read it last year and have been lending it to adults and students since. Everyone who has read it loved it.